Kids love Halloween, and one of the best parts about Halloween (besides the candy, of course) is turning a pumpkin into something cool, crazy or scary. The traditional way to do that is to carve out a face or other neat design, but you can’t hand a kid a sharp knife. So how do you get little ones involved in the creation of their dream pumpkin? 1. Colored markers are the perfect way to draw on whatever you like. Younger kids can scribble (or color in pictures you draw), while older kids can write words, draw cats, witches, whatever! 2. Break out some stencils, glitter, sequins and glue to bedazzle any pumpkin. The pumpkin itself embodies Halloween, so stencils can be any shape or size. Why not make some glittery green pine trees or pink hearts on that nice orange canvas? 3. For something completely different but in keeping with the holiday, first have your child paint his pumpkin white. Then glue on some store-bought black cobwebs (or create them using yarn). The final step is to attach some plastic spiders for a creepy, crawly pumpkin! 4. Paint a pumpkin black and decorate using white paint to make a witch’s face, a family of ghosts, a skeleton or just the word BOO! 5. Paint a pumpkin gold or silver and let your child have fun gluing on candy corn, jelly beans in assorted colors and other colorful candies. See if he can make a pattern or his initial on the pumpkin using these sweet treats. 6. Now your child’s pumpkin can match her costume! Mr. Potato Head pumpkin decorating kits are all the rage these days and can be found at practically any store that sells Halloween decorations. If you can’t locate any, check Amazon.com. Kits are sold in many different types, like witch, vampire, pirate, fireman, princess and more! An added bonus is that these kits are reusable, so they are friendly to the environment. 7. Along the lines of Mr. Potato Head, you have the wooden pumpkin decorating kit for the 5 and up crowd. Mix and match the pieces for even more fun. This one looks like it would be a big hit at a Halloween party or an October birthday party. 8. Recreate your family in pumpkins! You can buy a mini pumpkin to represent a baby in your family, a large one for a dad or mom and medium-size pumpkins for children. Raid the craft drawer and let the kids go to town gluing on cut-out felt and yarn for clothing and hair, buttons and ribbon for additional decorations. 9. Have a ball! My youngest son is in love with any sport that involves a ball. I’m thinking he would be thrilled to help paint a pumpkin white like a baseball then draw on some red stitching. 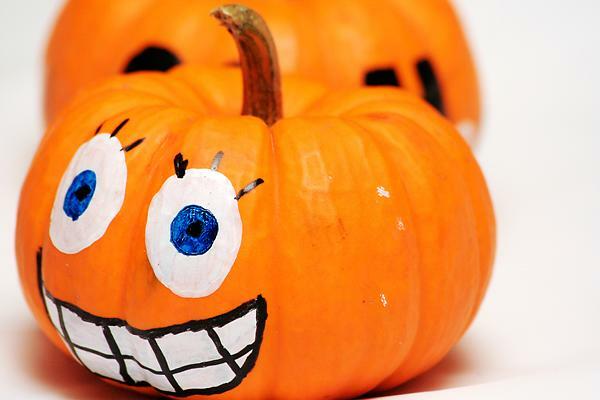 You can also make a basketball or soccer ball out of a pumpkin – just don’t throw it! 10. Cut out shapes from sponges, put some washable paint in small bowls and let your little one have some stamping fun on a pumpkin. Kerrie McLoughlin is author of The Tater Tot Casserole Cookbook and other ebooks, and blogger of chaos at TheKerrieShow.com.